Skechers’ marketing pitch: Flight Gen provides optimal impact protection and response. 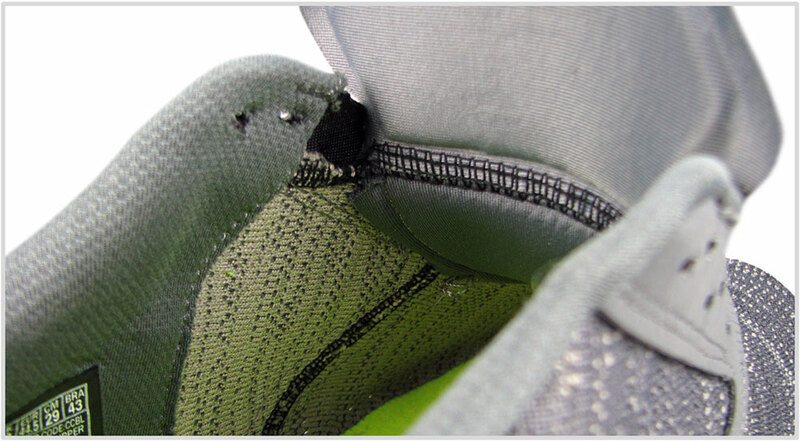 Upper: Knit mesh, inner gusset, synthetic overlays. Midsole: Full-length Flight Gen foam. 6 mm heel-to-toe drop. Outsole: Multiple strips of rubber. 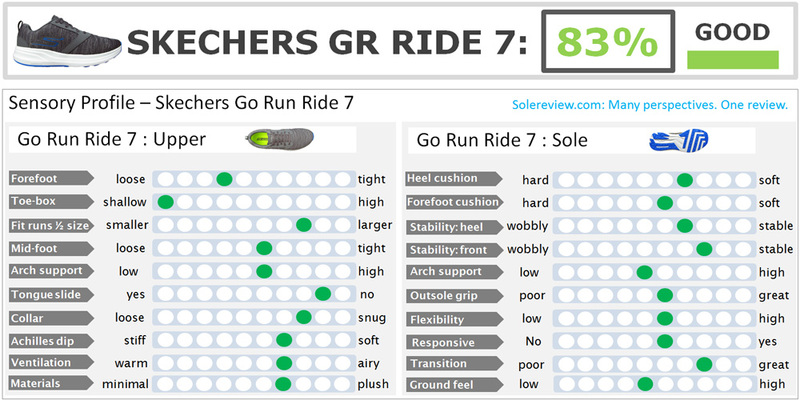 The Ride 7 gets a redesigned midsole and outsole which results in a vastly improved ride quality. The sleeved upper is comfortable but still needs some work. We have no idea how much business the performance running division generates for Skechers, but we suspect it isn’t a lot. After all, most of the Skechers product line is about affordable athletic footwear spread across a wide range of categories. Skechers sells everything from work shoes, boots, golf products, casual sneakers, and kids footwear. If there was ever a true ‘family footwear’ brand, Skechers is it. And yet, in the past few years, Skechers has managed to establish a credible assortment of running shoes which hold their own against much larger brands. In retrospect, signing Meb Keflezighi in 2011 turned out to be a pivotal move. When Meb won the 2014 Boston Marathon, he helped Skechers break out of its lifestyle brand image. Today, the Skechers performance and lifestyle product lines happily co-exist, something which is very hard to achieve. 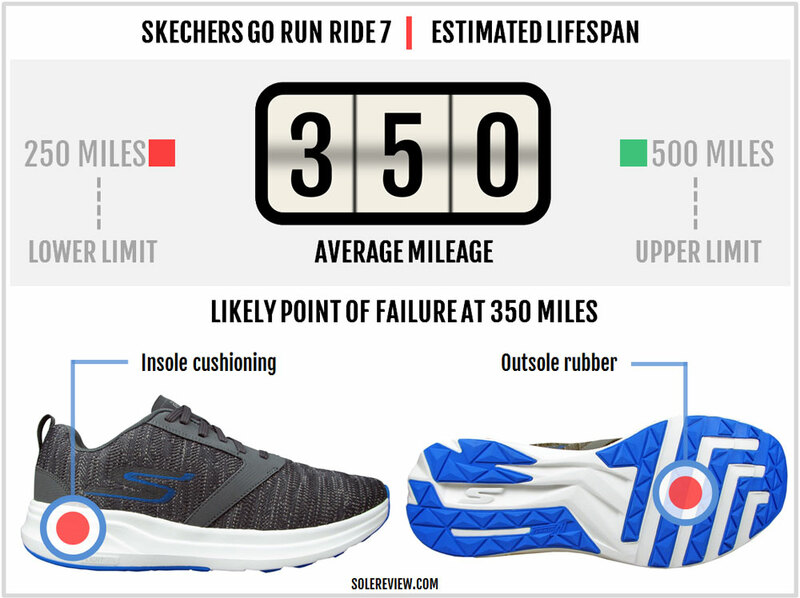 And to Skechers’ credit, the performance running has improved by leaps and bounds over the last few years. Skechers has a huge ‘performance’ assortment but there are only half a dozen models with legit running credentials. That would be the cushioned GoRun Ride 7 (reviewed today), the GoRun 6 and Go Meb Razor 2 (both fast training models), and the GoMeb Speed 5 racer. The GoRun Ultra Road 2 is also an excellent max-cushioned roadster. 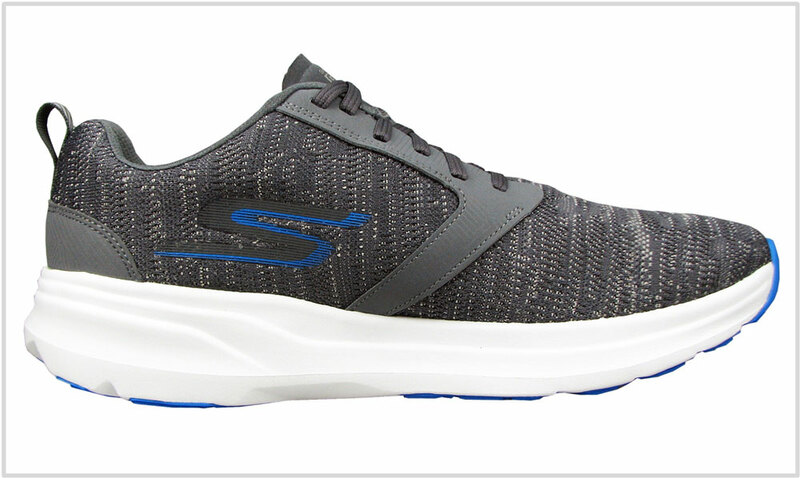 If you’re looking for a stability shoe, then the Forza 3 is the Skechers shoe to buy. The best part about buying Skechers is that one does not have to spend obscene sums of money. Most shoes are priced between $90 and $120; for example, the GoRun Ride 7 retails at $90. 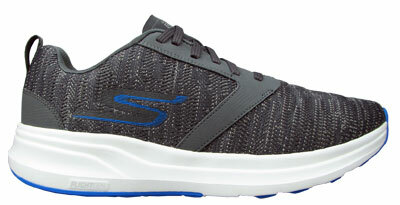 The GoRun Ride 7 has been Skechers’ staple neutral trainer for over six years now. In terms of cushioning, it is positioned between the uber-cushy GoRun Ultra Road 2 and the firmer GoRun 6. 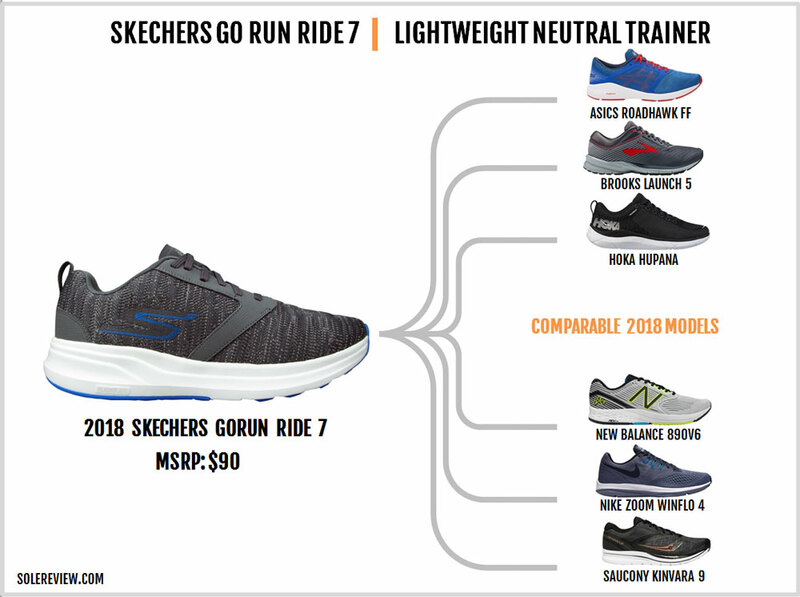 And like the rest of the Skechers performance line, the GoRun Ride has improved a lot over the years. The 7th edition is a brand new shoe from the ground up. The midsole is retooled with a new design and foam material, and the upper has been completely reworked. Skechers calls the new foam ‘Flight Gen.’ While the formulation appears to be an EVA foam blend, its on-road performance is excellent. If you don’t have the time to read the entire review, here’s a short summary. 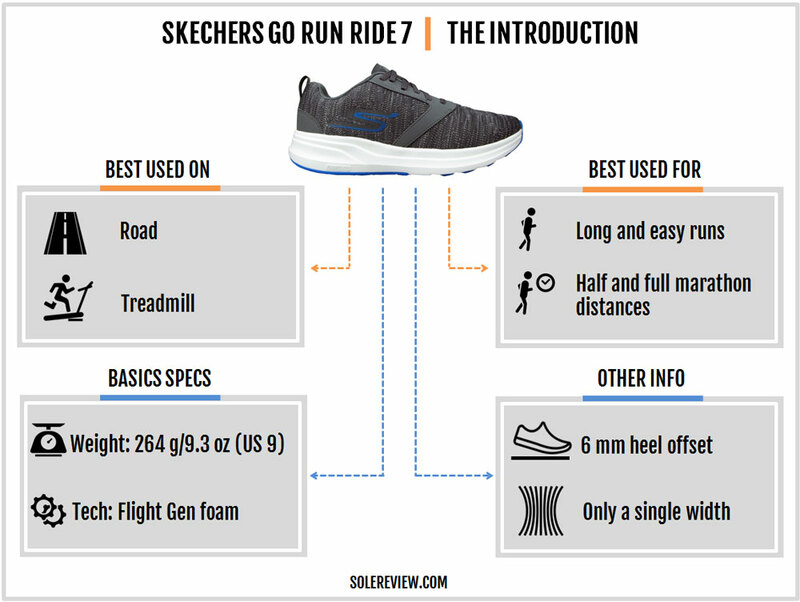 As far as the ride quality goes, the Skechers GoRun Ride 7 is much better than the V6. The upper fit, while extremely comfortable, isn’t perfect. It’s a mite long in the toe-box and the dual-insole strategy leads to less than ideal consequences for the fit and the ride quality. Even with its minor shortcomings, the Ride 7 is great value for money. If you’re going shopping for a cushioned trainer, then the GoRun Ride 7 should be on your list. One of our pet peeves with the ride quality of older generation GoRun Ride models was their lack of liveliness. The midsole had plenty of padding, but one couldn’t help feeling that the cushioning was maxing out with every foot-strike. We’re happy to report that isn’t the case with the Ride 7. The Flight Gen foam feels dense and substantial under the foot. The midsole is also firmer than the GoRun Ride 6 and the earlier Ride versions. As one can expect, these changes produce a markedly evolved ride character. The Ride 7 offers a high quality of cushioning without the flatness of the previous models. The midsole stack is thick throughout its length so there’s plenty of cushioning regardless of how or where you land. The heel looks much thicker than the forefoot. But then, you have to account for the higher sidewall edges which make the midsole appear thicker than it actually is. This means that there isn’t a lot of difference between the heel and forefoot thickness; the 6 mm heel-to-toe gradient is proof of that. We don’t what exactly the Flight Gen foam is made of, but it feels a bit like a softer version of Hoka’s RMAT. 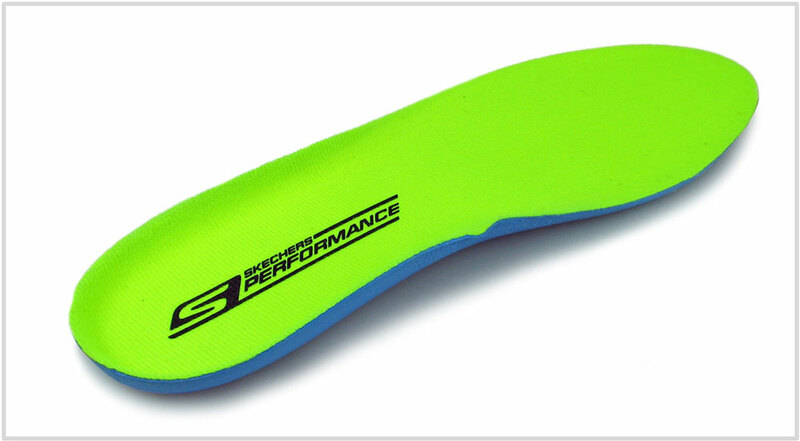 The foam has a resilient feel and resists deformation better than the previous Ride 6 midsole. The new Durapontex insole also delivers a better quality of under-foot cushioning. For a long time, the curved ‘M-strike’ design was the GoRun series’ calling card. 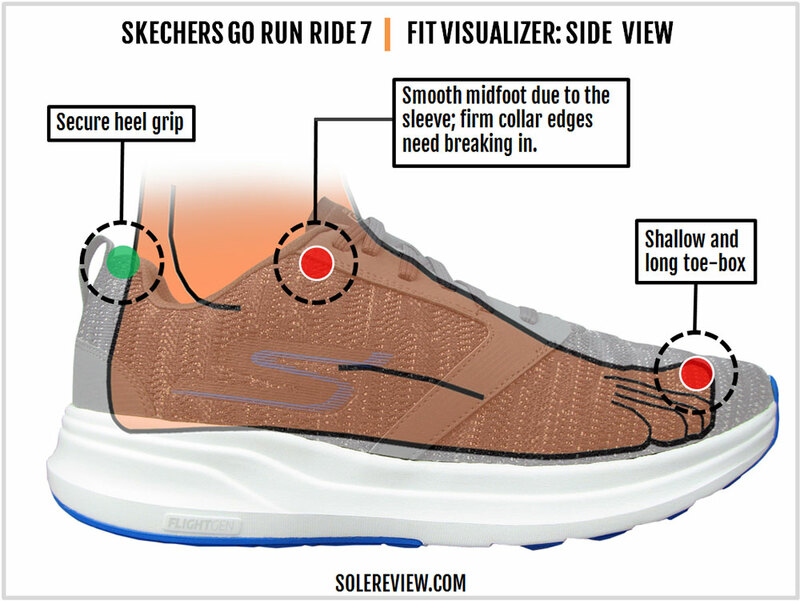 Skechers claimed that the rocker-shaped midsole promoted a late rearfoot (midfoot) strike. Over the years, the midsole has evolved into a more conventional design. 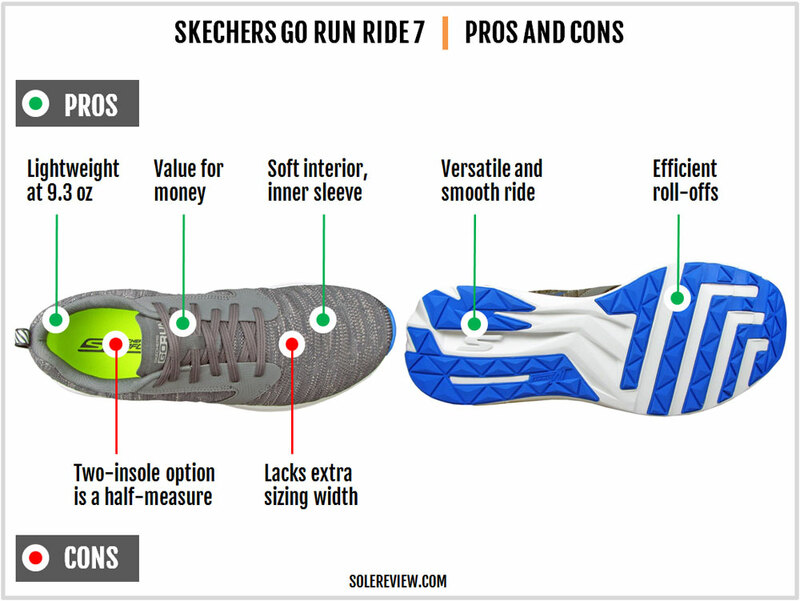 The Ride 7 doesn’t have the noticeable rocker-shaped midsole, but Skechers still mentions ‘M-strike’ on the outsole. Today, M-Strike is more of a marketing ploy than functionality; it is something familiar to connect with Skechers loyalists we guess. But M-Strike or not, the Ride 7 has an excellent transition character. There are multiple factors which make this happen. The midsole isn’t squishy soft so that allows the foot to load progressively without sinking. There’s a certain amount of responsiveness too. Though Flight Gen is not in the same league as the adidas Boost or Nike React, the foam does have some feedback. Skechers has done an excellent job with the outsole design and placement on the Ride 7. This brand new design replaces the pillar cushioning layout of the earlier GoRun Ride. The Ride 7’s outsole lugs do not protrude and are placed nearly flush with the midsole foam. This helps the midsole and the outsole behave as a cohesive unit, thus delivering a smooth transition. The forefoot is relatively stiff so it is conducive for efficient push-offs during the gait cycle. All these factors come together to give the Ride 7 a versatility suitable for a variety of use-cases. If you’re running long and easy (10 min/mile or 6 min/km or slower), then the Ride 7 has all the cushioning one needs. Be it an easy 5k or a marathon, the Ride 7 will do what’s asked of it. Even if you ramp up your speed to 7 min/mile or 5 min/km or faster, the Ride 7 feels efficient – thanks to the just-right foam density and other features which enable smooth transitions. The Ride 7 also performs well on the treadmill too. That said, if you’re planning to go racing then you should read our rotational recommendation(s). The lasting also doubles as the sockliner should you choose not to use the supplied (removable) insole. As long as we can remember, the GoRun Ride 7 has been available in a dual-insole setup. There’s a removable insole like most running shoes, but the lasting below it also doubles as the sockliner. The lasting has a soft nappy lining like the insole, complete with a thin layer of foam padding. The absence of the insole leads to a major alternation in the ride quality. The midsole feels flatter, and as it turns out, the change in ride character will be the least of your worries. Removing the insole affects the upper fit too, something which we’ll cover in the following section. We advise using the supplied insole unless you have very strong reasons for not doing so. With each major GoRun Ride update, the upper fit character has changed dramatically. The Ride 7 is no exception. If the Ride 6 was slightly shorter in length, the Ride 7 now adds space to the sizing. And yet, the long fit doesn’t mean that you should buy a half size smaller. Because what the Ride 7 adds to the sizing length, it takes away from the width and the height. The toe-box is shallow and is snug on the forefoot sides. This can be attributed to the internal stiffener (see image below) which makes the front pointy. This means that getting a half-size smaller will make the toe-box shallower than it already is. The sock-like forefoot snugness extends all the way to the synthetic midfoot panel. The fit can be customized slightly by the adjusting the first row of lacing. None of the narrowness causes any irritation though, as the forefoot mesh is soft and accommodating. For example, even with the big toe touching the forefoot mesh, the material comfortably molds over the foot. The mesh structure is generously pored so the ventilation levels are decent. The external synthetic overlays provide structural support to the upper without adding stiffness. They are thin and flex along with the upper. There’s a seam inside but Skechers uses a soft flat-lock stitch to ensure a smooth interior environment. The synthetic panel houses the lacing eyelets and is placed well clear of the forefoot. This is a good design practice because the panel will not bend into the forefoot during flexing. There’s a downside of this open forefoot design. The upper doesn’t feel locked-in when running around tight corners, be it the road or track. Given the snug fit, this sounds counter-intuitive. But the level of forefoot lock-down has as much to do with the midsole design as it does with the upper fit. The Ride 7’s midsole isn’t wide, leaving no margin under the upper. The Ride 7 performs best under linear, road running conditions. The tongue flap has been redesigned to make it softer. The material is a pliable synthetic bonded to a soft mesh lining backed with foam. The tongue doesn’t slide because it is attached to the knit upper. The edges are thin and soft, similar to how some racing shoes are designed. Compared to the mid and forefoot, the heel area needs some time to break in. The combination of the internal counter and padded lining grip well, but the collar edges are high and feel stiff initially. This is particularly true of the lateral (outer) side than the inner collar. On a side note, the collar looks lower from the outside because of the raised midsole walls. Don’t worry; the heel has sufficient depth required for proper grip. 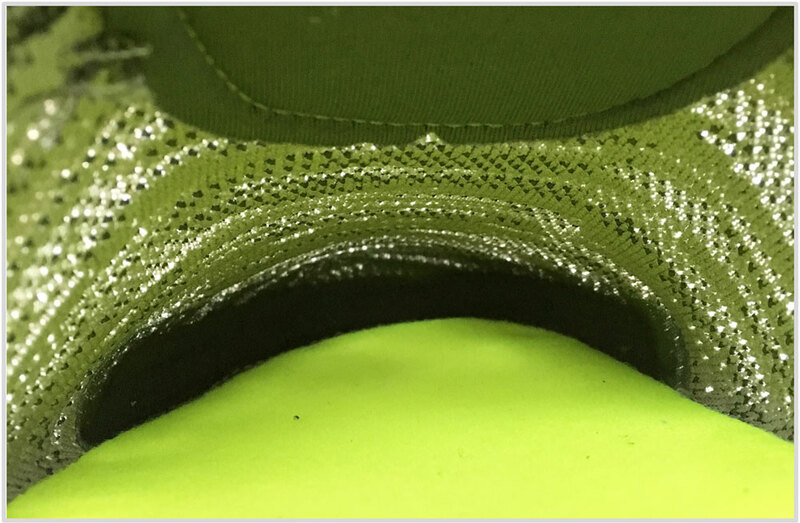 Reflectivity is provided through the striped pattern on the heel pull tab. What you read above was a review of the upper fit with the insole. So what happens when you wear the Ride 7 without the insole? 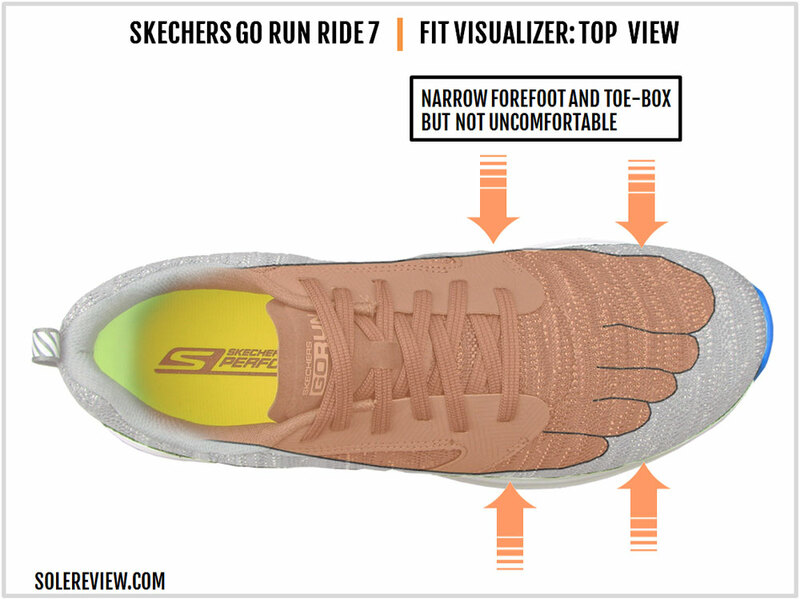 Using the Skechers GoRun Ride 7 without the sockliner isn’t as bad as it once was. The increase in the forefoot space and toe-box height is immediately noticeable, making the upper very relaxed in the front. But this approach isn’t without its downsides. The area near the tongue flap becomes stiffer. This happens because when you remove the insole, you end up lacing the shoe tighter. When you do that, both the lacing ends come together and bunch up together with the tongue flap. Also, the stock lasting does not grip the underside of the foot as well as the Durapontex insole does. This is not a problem at lower speeds, but once you pick up the pace, the foot tends to slide inside. There’s another thing you need to watch out for. The forefoot midsole has a narrow base, so some runners might feel the edge of the midsole during longer runs of 10 miles and more. We certainly did. The moral of the story is: If you want to do some serious running in the Go Run Ride 7, keep the insole. But if you’re just walking around downtown, you can wear the insole-free version without any problem. But not everybody’s going to read this review. 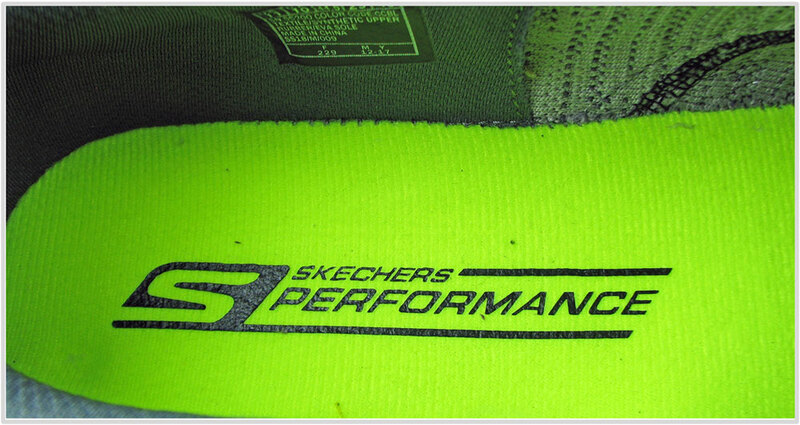 Skechers’ removable insole strategy is not ideal because it causes significant changes to how the shoe fits and rides. Most brands don’t do this for a reason – it keeps things consistent. 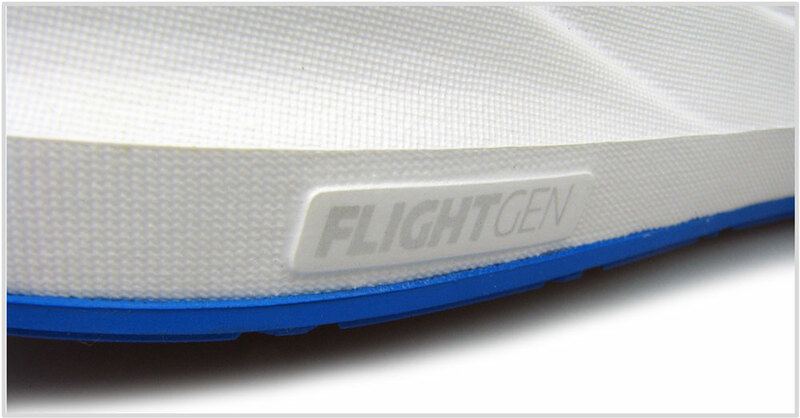 Unlike the legacy Skechers foam, the Flight Gen foam displays higher resistance to creasing. If that’s any indication, the midsole will retain its cushioning longer than the previous GoRun Ride versions. 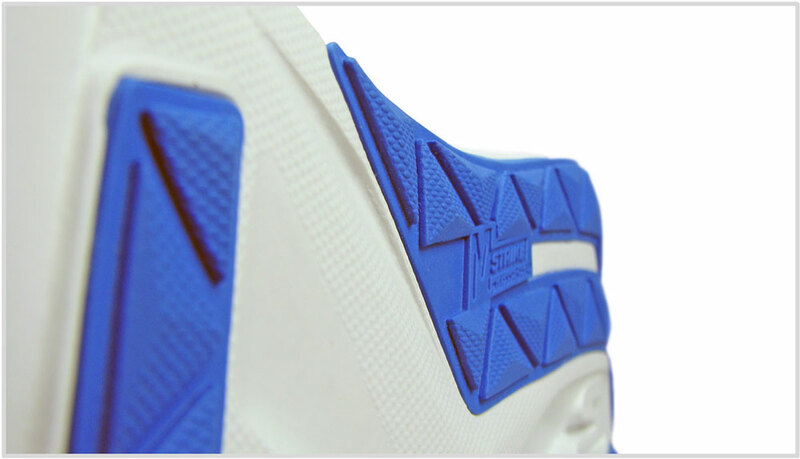 And not only is the outsole generously covered with rubber, the lugs also lie flush with the foam. This makes it less susceptible to premature wear and tear. The insole has improved too. The GoRun Ride 7 now uses a Durapontex insole instead of regular EVA (New Balance also uses Durapontex). Thus, the overall levels of durability for the midsole and the outsole have improved. The toe-box has a shallow fit, so it remains to be seen whether (or not) rubbing becomes an issue after a few hundred miles. We haven’t come across cases of upper failure, but we’ll report back if we do. For a shoe with a thick and cushioned ride, the Ride 7 is surprisingly versatile. Even at slightly higher speeds, the Ride 7 doesn’t slow you down. The non-mushy character of the Flight Gen foam and the relatively stiff forefoot helps with the seamless toe-offs. And if you want to run the long and easy route, the new midsole has a tankful of cushioning. Its lightweight sub-10 ounce construction only makes it better during longer runs. It’s also great value for money. There are very few shoes at this price which combine a highly padded ride with a knit upper made of premium feeling materials. The interiors are smooth, and the presence of an inner sleeve is a bonus. We have been never a fan of Skechers’ optional insole policy. Removing the insole messes with the fit and ride quality, and the Ride 7 is better off sticking to a conventional set-up. Also, the Ride 7 is available only in a single width. This puts runners with a wide foot at a disadvantage. The Ride 7 has a thick midsole, but it doesn’t push the boundaries of max cushioning. Filling that role is the Go Run Ultra Road 2, another Skechers shoe with a higher level of cushioning. So if you want to run beyond a marathon distance or simply need something more cushioned than the Ride 7, then the Ultra Road 2 is the shoe. And if wanted to complement the Ride 7 with a non-Skechers shoe, then the Hoka Clifton 4 offers a lot more cushioning. For race-days (5K, 10K) or speed runs, the Skechers GoMeb Speed 5 is an excellent choice. The Go Meb Speed is a far cry from the initial versions and has undergone vast improvements. If not the GoMeb Speed 5, then the New Balance 1400V6 is perfect for short races. 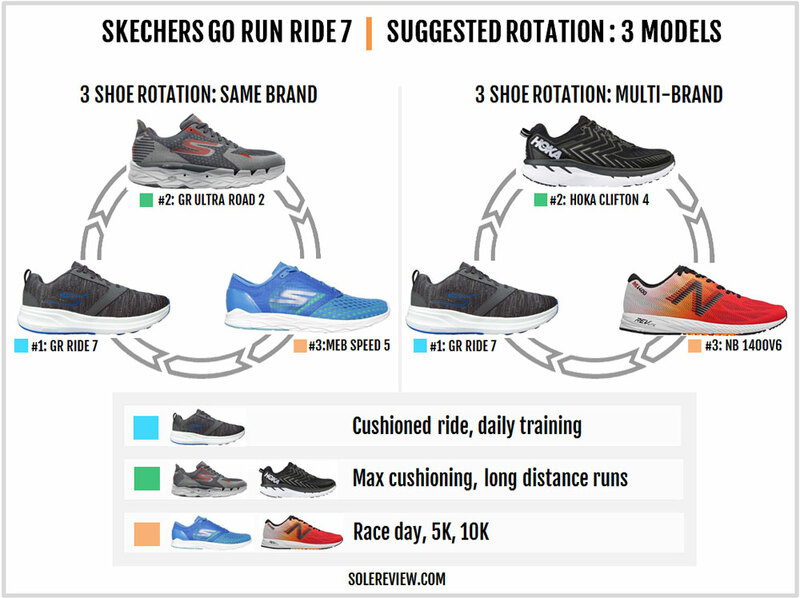 The Skechers Go Run Ride 7 is a sub $100 shoe, so very few products compete directly with it. The best we can do here is to compare them to models which are $10-20 higher in price and serve a similar purpose. 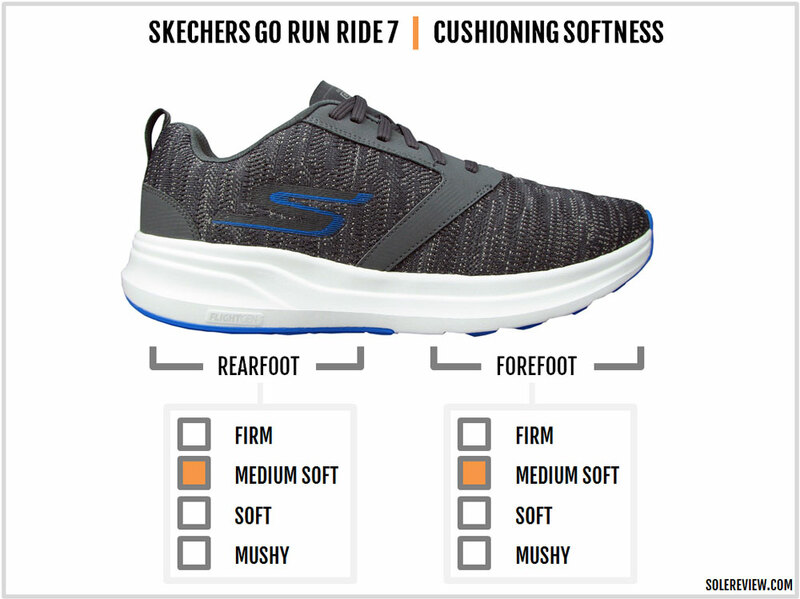 Regardless, the Skechers Ride 7 is more cushioned than all the shoes listed here. Beginning alphabetically, the Asics Roadhawk FF is a lightweight and entry-level neutral trainer with a firmer midsole than the Ride 7. The Brooks Launch 5 also performs a similar function. The Launch has a firm-ish and lightweight ride quality under a comfortable upper, making it suitable for fast-paced daily training runs. The Hoka Hupana has a similar heel-to-toe offset of 5 mm along with a knit upper and a ride which is in the Ride 7’s ballpark. The New Balance 890V6 isn’t exactly what you can a Ride 7 equivalent, but considering the unavailability of the Boracay, this is the best we can do. The 890 is the replacement for the Vazee Pace but with a softer ride and a more comfortable upper. Till the time Nike comes out with a Lunaracer replacement, the Winflo 4 is your budget neutral trainer of choice. It’s an under-rated trainer with a snappy ride on a lightweight build. Lastly, the Saucony Kinvara 9 has long been the torchbearer for lightweight cushioning with a low heel drop. Definitely worth a try if you’re shopping around.